Last week I visited my family on the east coast and when my youngest sister picked me up at the airport, our first stop was the Thrift Store! This is our favorite thing to do together. My middle sister would rather have hot needles stuck in her eyes before she would dig around in a thrift store. Is that how you feel too? After you see my score, you may reconsider! As soon as I walked in, I spotted a St. John Knit twin set in my size for $7.99. That is not a typo. If you are not familiar with St. John Knits, they are an upscale American fashion brand that specializes in women’s knitwear. They are known for their timeless designs and use of beautiful buttons. The garments are made of a heavy knit and in my opinion, are an American classic. You can find them at Neiman Marcus and other upscale retail stores and can range from hundred of dollars to well over $1,000! 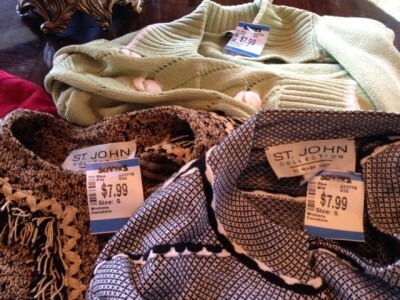 We kept digging and I ended up with 5 St. John Knit twinsets, some were $7.99 and the nicest ones were a whopping $9.99! 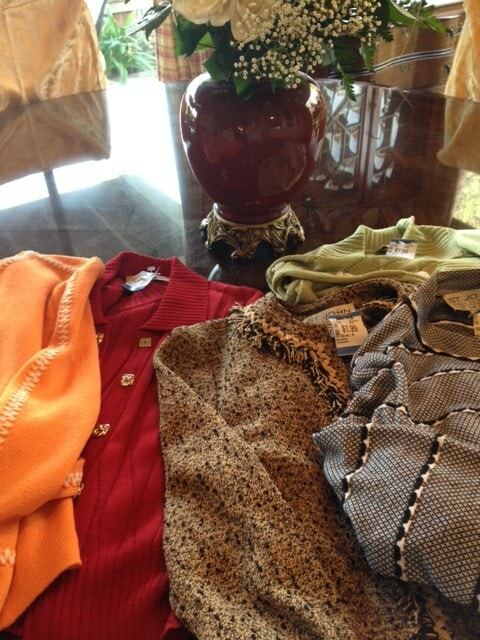 To the lady who cleaned out her closet, I thank you! Last year, I bought a pair of Ferragamo shoes at the Thrift Store for $7.99 that I will wear with my St. John Knit twinsets. If you see me and I look like a million bucks, well I paid about $20 bucks for the outfit! This is my Super Bowl!! 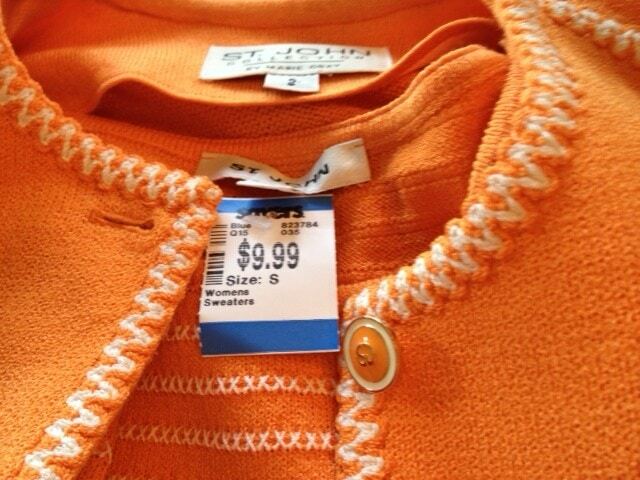 What is your favorite Thrift Store score? I found a Brunello Cuccinello soft sided buffalo hide briefcase at Salvation Army for $150 (they new they had something special!) and resold it promptly on eBay for $2,8K! Scouring thrifts is my fulltime job! I love love LOVE it! You have my addiction too! We bought my Hubby a swiss army knife brief case for $5.00 and it was slightly used but in great shape. I also love garage sales. I bought a brand new down comforter never out of the package for $10.00.